2018 Update: We still think this was an interesting discussion of Instant Pot tips for busy ladies — but you may also want to check out our more recent update of super fast Instant Pot recipes (great for long workdays!). All right, readers — who’s a fan of the Instant Pot? Which are your favorite recipes; what are your best Instant Pot tips for busy ladies? Unless you’ve been living under an Instant-Pot-sized rock, you’ve probably noticed the hype around this really versatile kitchen appliance. (NPR just referred to its “viral word-of-mouth success” in a headline the other day.) Many of you — like me — probably either got one or gave one for the holidays and have been spending the last month experimenting (or listening to someone else talk about their experimenting). A reader recently asked for a post similar to the slow cooker recipes post but this time specifically for Instant Pot recipes, and so we thought we’d gather some helpful links and recipes today. Do you have an Instant Pot? What do you use it for? 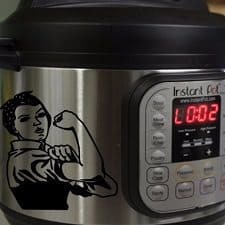 As a busy woman, do you find that the Instant Pot is better or worse than the slow cooker (where, for example, readers have complained that it’s difficult to find slow cooker recipes with long cook times to allow for their work schedules)! Whoa: Note that you can get decals, like this one from Etsy seller Emilia Sofia Boutique. I also like this Gosling-themed decal: “Hey girl, drink some wine while I make dinner” from Etsy seller Big Dipper Designs. Instant Pot is designed to replace a pressure cooker, slow cooker, rice cooker, steamer, yogurt maker, etc., and its fans use it to make everything from chili to cheesecake. The company offers several models with different sizes and features — the DUO60, DUO50, DUO80, LUX60, and the IP-Smart Bluetooth model — but we won’t take up space here describing the differences because Amazon already has a chart that does that. (Scroll down on the page to find it.) (Here’s a post from Hip Pressure Cooking to help you decide, too.) The Instant Pot is currently Amazon’s #1 bestseller in the Home & Kitchen category, and the price range is $80-$180, depending on which model you choose. If you have an Instant Pot, what’s your favorite thing to make in it? Do you think it lives up to the hype? What model do you have? How much time do you save by using it? What have been your successful and unsuccessful experiments so far? What are your favorite recipes or cookbooks? 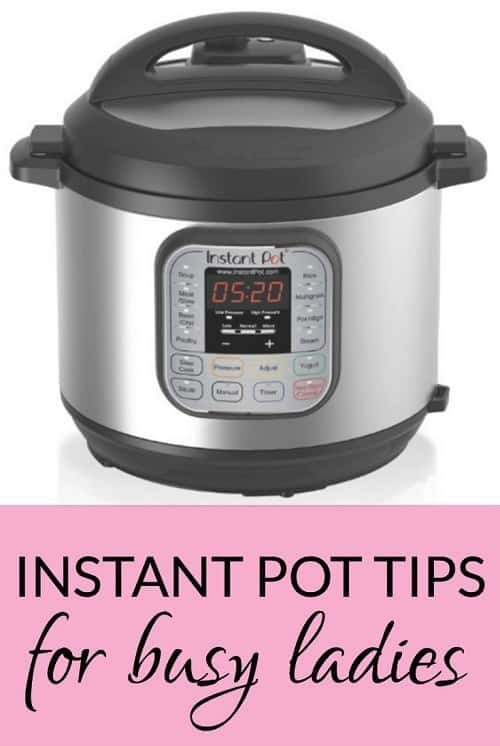 What are your best Instant Pot tips for busy ladies? “Fast cook” meats. Can do stuff I’d otherwise do in a slow cooker in about an hour or less-and you can do it from frozen. I’ll do pulled pork and other shredded meat. Soup with frozen chicken breast. Pasta and meatballs. It sounds dumb because it’s already so easy, but I have two small kids and watching a pot so it doesn’t boil over is a pain. A whole chicken roasted. I’ll use it like I use a rotisserie chicken since the skin doesn’t crisp. I have mostly used my Instant Pot as a slow cooker, but I just recently used the pressure cooker feature to cook brown rice. Apparently, you can’t use the “rice” button because that’s pre-programmed for white rice. Instead, you use the “manual” feature and set it to 22-28 minutes (depending on your elevation – I only needed 22 minutes) on high. The ratio of rice to water that I used is 1:1.25 (although I’ve seen some instructions saying 1:1). Also, my husband figured out how to get water inside the Instant Pot to be at a set temperature (120 degrees). I’m not sure how to do this, but I’m sure you can find it on the internet. We can pre-make soft boiled eggs (boil eggs for 6 minutes on the stove), and then pull them from the fridge and stick them in the Instant Pot for a minute or two. They come out perfectly warmed through and still soft boiled. Does anyone have the Breville Fast/Slow cooker “version” of this? 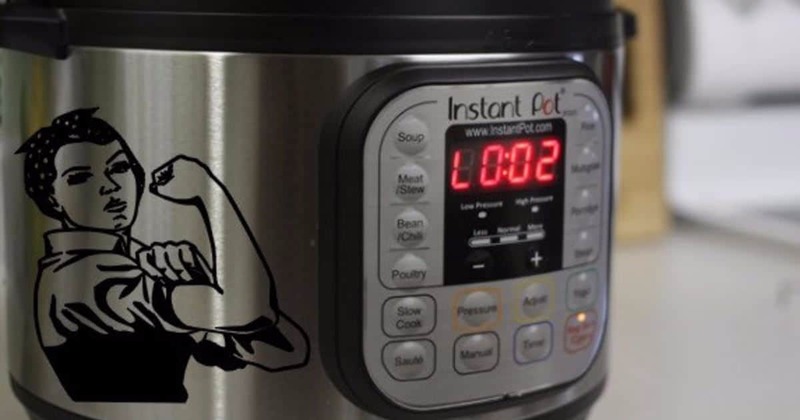 Have been looking at that as a possible higher-end version of the Instant Pot, but not sure if it’s actually better. I obsessively googled and researched the Breville versus this one. Although it has a nicer name brand, I came to the conclusion that the extra features/quality that may or may not be offered by the Breville did not justify the hefty price increase. I have not yet bought either (closed on a house last week and I have forbidden myself any new purchases until at least February!). I use mine to prep meals on Sundays. Getting a second liner was one of the best ideas I’ve ever had. I’ll make a big batch of chili, pop that out, put the other liner in, make a chicken curry, and portion the chili while the curry is cooking. The other life saver like Legal Aid Lawyer said is being able to cook from frozen. I’m the absolute worst at remembering to pull things out of the freezer to defrost and last night I was able to make dinner in 30 minutes using frozen chicken thighs! It was amazing. SUCH a good idea about getting an extra liner! You increase cooking time some (maybe 50% for bone-in chicken) http://www.hippressurecooking.com/pressure-cooking-times/#meat. It may also take longer to come to pressure. I don’t know why I never thought about this before… but thank you! I will be ordering another liner for my slow cooker. We use it to pressure cook steel cut oats — they come out perfect every time. We use the sauté function first to toast the oats (and coconut, nuts, cinnamon stick or whatever else we are putting in the oatmeal that would benefit from toasting). Reposting from the morning thread in hopes of additional responses. Serious question. The vast majority of my friends are democrats, as are most of the people on my facebook feed. I do have many republican family members and coworkers, but I hesitate to start this conversation with them as I fear it will negatively affect our relationships. My question is: For those of you who voted for Trump, how do you feel about the things he has done his first week in office? During his campaign, I heard a lot of people say they didn’t think he would actually do many of the things he was proposing. It turns out that isn’t true. Are you regretful? Happy? I just want to know how republicans (the ones who voted for Trump, at least) are feeling right now. Go read the WSJ or National Review. The average Republican that I know isn’t happy. My theory is that all of the Regan Democrats in rust best states or non-latte towns in the rest of the country are the Trump voters. Someone with a kid who went to Iraq and came back with bad PTSD or was in a car crash and got hooked on pain pills. Someone with a very hard life who is desperate for change. Fantastic!! The Donald be the Man. God give him the strength to see this thru, that’s a big Amen!! ? My FB is half and half (I’m one of those former lower class from a rural town who now passes for upper middle class in suburbia), and the Repubs seem to be very happy that he’s actually following through. They seem to be giddy with hope, which is a completely new concept for most of them. I am adamantly NOT a Trump supporter, but I do think his platform of change was way more inspiring for its target audience than Obama’s was, and that’s not diminishing Obama. I just think the disillusioned working class whites were completely ignored as a factor so no one realized how inspiring Trump really was for them. His 200 day plan is like “proof” that he was the best candidate – he’s going to come in and actually do things, unlike real politicians who have run this country for years and never gotten anything done. Now he’s following through and going to create jobs and simplify the tax code and look, the stock market is up so clearly all the smart people in the world think he’s great too. Paella – super quick and delicious and quinoa. Going to try yoghurt soon. We mostly use the pressure cooker function. We’ve had fantastic (& fast) risottos and stews that way. But we also like that we can use it as a delayed start pressure cooker – we had a great chicken tangine that way just last night. How many days a week do you…. Are you single or coupled/family? Married with a toddler. We plan to get take out 2x a week, and occasionally 3x in a week when we’re really busy/stressed/lazy. We aim to cook the rest of the week. We usually have 2 slightly more ambitious meals in a week (say, new flavors or slightly greater effort than normal mid-week fare) and then 2-3 easier meals that we could make in our sleep. We rarely forage. Not for any real reason but we don’t have a lot of extra food in our house other than for planned meals. If I really don’t want to stick with our meal plan, my go-to is usually breakfast-for-dinner. I’m single but how many days I eat dinner at home depends on what I have going on that week. I tend to be over-scheduled so I have plans most days after work, sometimes it’s just drinks so I’ll eat at home later in the evening and sometimes it’s dinner. I try to cook a few things on Sunday (usually one thing for dinner, one for lunches) and eat that throughout the week. It’s much easier for me to just heat up leftovers and not have to think about what to eat when I get home. That way, I eat much healthier. I try to limit the takeout to 1-2 times a week. I do end up eating out usually one or two evenings during the week either with friends or on a date. During the week, I hardly ever cook. Single, no kids, eat the majority of my daily food intake between 6:00 a.m. and 4:00 p.m.
It’s just the two of us here. Once a week Lovely Husband goes out with the lads and I either stay home and eat my beloved pan fried ramen or go out with my friends. We almost always go out at least twice on the weekends (Fri-Sat-Sun). If we’re home and there’s no Blue Apron in the fridge we will either forage or make a special trip to the store to get something fun to cook. We almost never get takeout, except for pizza once in a blue moon. Married, no kids. We cook 3-4 times a week, get meal delivery or take out 1-2 times a week, and go out to dinner 1-2 times per week. We also sometimes have cheese and cold cuts for dinner, depending on how late we get home from work. Our family consists of mom, dad, and one extremely picky tween girl living in a suburban culinary wasteland. We aim to cook six nights a week and eat out one night. I plan all meals for the week before shopping on Saturdays. If I am too tired or don’t have time to cook a planned meal, I will swap it with another night’s meal or stick the ingredients in the freezer and improvise something else. We almost never resort to takeout because there is nothing good to pick up nearby and the only places that deliver are pizza chains. My husband loves to cook, so we almost always eat dinner at home. We do sometimes eat lunch out, but usually take leftovers to warm up. Just the two of us — empty nesters who both work full time and then some. Single, no kids. I cook 4-5x a week, eat leftovers for 1 or 2 nights, and then eat out about once a week. It’s not unusual for me to not eat out/get takeout in a given week (I’ve been sticking to a tight budget). I try and make large batch meals in the slow cooker to use for lunches, as well as dinners. And it’s also not unusual for dinner some nights to just be cheese and crackers. Or nothing at all if I overindulged at lunch. I’d say we cook dinner 6 nights a week on average, including eating leftovers (if that what forage means?). We don’t really ever get takeout, but go out about one day a week on average. Married couple with 4 boys. Oh hello there! I’m a lawyer mom with 5 boys. Two adults with full time jobs in my house. We aim eat at home six nights a week and pack our breakfast and lunches every day for work (also eat at home on the weekends for lunch, occasionally we’ll go out for breakfast on a Saturday or Sunday). Sometimes we have two meals out during the week. We try to make meals that are not home-prepared a social event (i.e. together, or separately but with friends) and not a matter of convenience. This is a reaction to doing our year-end finances and realizing how much we spent on take-out/eating out. No shame to people who prioritize their fun money that way — we just have some other saving/spending goals for the year. I usually only cook non-breakfast food three times a week, and do make-ahead recipes other nights. Typically, this means I make two larger meals on Sunday for rotation, and cook again on Wednesday or Thursday for the rest of the planned meals. If that schedule falls apart a little, we always have things to forage. “We try to make meals that are not home-prepared a social event (i.e. together, or separately but with friends) and not a matter of convenience. This is a reaction to doing our year-end finances and realizing how much we spent on take-out/eating out.” THIS! We made it a “rule” that if we wanted to eat out, we would either splurge for a date together or going out with friends, or eat super cheat take-out if we’re just being lazy. But the mid-range restaurants in our HCOL city cost $40-$50 for the two of us, so we were wasting a lot of money on convenience when the food wasn’t that great, and the time saved vs. cooking was minimal or negative. So either we go to a steakhouse for a date or happy hour with friends, or eat $10 Chipotle/Five Guys/poke bowl, but no more $50 dinners for a chain restaurant! Basically, we aligned the value and expectations with the dollars, instead of just randomly spending money for food. Married, both working full time, one toddler. We try to limit takeout/eat out (for dinners) to 2x per week. During the week, one of us does bath/bed with toddler while the other one cooks our dinner. We try to do as much prep in advance as possible or cook on Sunday to re-heat but usually someone’s cooking a couple nights a week. Recently we’ve been making more of a point to cook Saturday and Sunday dinners at home because there’s more time; we save takeout for busy work nights that way. I am a happy forager; my husband generally is not. If he works late or something, I will create meal (or glorified snack) from whatever’s handy. Couple, no kids. We plan all 7 meals a week, scheduling in meals out and social events. We eat out socially maybe once a month, and order take away once a month. Obviously if I am in a heavy travel period (ie I’m about to start a period of being away for 16 nights out of 20), then my eating habits change but my OH will still plan all meals and generally cooks all days of the week. We shop as per the meal plan, so while we hold generic items we generally stick to the meal plan 99% of the time and therefore there is no need to forage. Those items are used if flights get delayed/work holds someone back/plans change, and means that there are frozen veggie burgers, oats/cereals, and frozen bread products available. We’re DINKs with time-consuming hobbies outside of our full-times jobs. DH cooks a hearty breakfast ~5x per week, I cook two meals in bulk on the weekends so that we can have leftovers during the week. DH usually forages (epic protein smoothies, peanut butter + fruit + nuts, etc.) for snack-that’s-almost-a-meal daily. I eat out 1x-2x a week for lunch or dinner, depending on my work/hobby schedule, and DH eats lunch out maybe 3x per week? My office has catered lunch 2x/week, and both of our offices have snack options, though we generally prefer to eat healthier than what’s provided. Married couple with one child, age 10. We only have dinner out once a week on Wednesdays, and we try to pick something that will give us leftovers the next day. My husband and son are heavily involved in karate and have class twice a week (Tuesdays and Thursdays) at 7, so those days we do something quick – sandwiches, smoothies, leftovers – to get them fed and out the door in time for class. Mondays and Fridays, my husband cooks dinner and I cook on Saturdays and Sundays. This is a function of our schedules – my husband gets home before I do, and it’s easier for him to start dinner on weeknights. I try to use my crock-pot but just forget, a lot of the time because mornings get kind of crazy. I’m not good at remembering to put things together the night before, and our fridge isn’t big enough, really, to store the crock from the crock-pot. I have a pressure cooker I should use more often. We cook pretty simple meals most of the time – spaghetti, chicken kabobs with rice, tacos, stir-fry. I use ours several days a week. Steel cut oats, mashed potatoes, pork loin… I also make quick meals like meatballs and spaghetti, or rice + veggie + protein. For those of you who love your instapot – do any of you live alone? Just wondering if it is worth it for me to get as I live by myself and have a crock pot. I have been cooking for just myself this last month and love it! See my comment below for how I use it. Like BabyShark I use my IP to batch cook food once a week. I also have a stove-top pressure cooker. With both of those, I’m able to make a large soup, some saucy beans or lentils, 2-3 sauces, and some kind of starch (rice, potatoes or sweet potatoes) in about 2 hours. I also chop up some veggies and make some bowls of oats/chia pudding that I can top with fruit for breakfast. With all that, I usually eat pretty darn well during the week by mixing and matching sauces, starches, and veggies for any given lunch or dinner. It takes no time at all to combine/reheat a meal and I almost never eat the same thing twice. Example 1: This week, I made a vegetable bolognese sauce. Earlier this week, I used it on zucchini noodles. Today, I’m eating it on polenta with some chopped kale. Tomorrow, I’ll mix it with some chickpeas, veggies, macaroni and broth to make a minestrone. Example 2: This week’s beans are tomatillo-poblano white beans. I’ve had them over potatoes that I microwaved at work with a cheesy sauce. I’ve also made a taco salad with the beans, greens and rice. I also plan to poach an egg and have green huevos rancheros. This sounds pretty much like my ideal way to eat. Which model do you have? Does food from this thing come out soft like from a slow cooker? I’m interested but find that there is a limit to how many soft smooshy slow cooker consistency type foods I want to eat on a regular basis. Somewhat–it does best with things that usually cook slow and moist, like braises and stews. It doesn’t have the problem I have with slow cookers of just tasting like mush, though. The flavors and textures don’t break down as much. My favorite approach to meat is to braise and then finish under the broiler for a few minutes to crisp while I finish/plate the rest of the dish. I’m considering buying an insta-pot and would love to know which version you purchased. In hindsight, would you have purchased a different model? Which one? Thank you so much for your help. You are all so wonderful for sharing. I have the instant pot 8 quart. I did a bunch of research and came to the conclusion that was the best one and I have a large family and like to batch cook, so I got the large one. I was planning to ask a question today about trying to cook more at home. I was looking for things that would be quick to make (less than an hour, ideally less than 30 min), could be protein-focused, and aren’t expensive. Trying to bring our grocery/eating out bill down without resorting to pasta every night. Is this the answer? I think meal planning and being good at prep work is the answer, not fancy gadgets. It’s a lot faster to get dinner on the table when you’ve got everything pre-chopped and ready to go. I’ve been doing a lot of skinnytaste recipes lately and they aren’t overly expensive. I like my instantpot, but pressure cooker recipes are deceptive for timing. You may only need to cook the meat on high pressure for 10 minutes, but that time doesn’t include browning it first, bringing the pot to pressure (which may take 15 minutes, similar to preheating the oven) or the time needed for pressure release. The advantage is that it’s more hands-off and you don’t have to heat up the oven or stove. Thanks. I’ll look into the skinnytaste recipes you mentioned. Any other resources you’d suggest? You’re right that it all comes down to meal planning and that is our big problem. We get Fresh Direct delivered about once a week and get 2-3 days worth of things that basically just require heating in the oven. The problem is that we then resort to pasta or takeout the other nights because we don’t have other things at home. This is my challenge for the year! I did cooksmarts for a while. The recipes were higher calorie that what I was looking for right now, but it had some features I liked. You could pick meals for the week and it would generate shopping lists/give you things to prep-ahead. There are a lot of meal planning resources out there so you may want to play around with a few to see what works best. I swear I’m not a shill for Cook Smarts, but I saw the recommendations on here for the service, and I love it. I’ve been using them for a few months. Some weeks I’ll want to make all of the recipes they provide, and other weeks I won’t want to make any of them. But the great thing about the service is that you can look through the archives or favorite recipes and just add them to your current week’s meal plan. Once you do that, you can build a grocery list and they’ll outline “weekend prep.” It’s been really helpful for weeknight cooking to chop all the carrots, celery and onion for Tuesday’s soup on Sunday, or to pre-make the sauce for Thursday night’s meal. I think they have a free trial week or something like that. I paid for a year, and I think I would pay for it again once my subscription ends. Thank you both! I’ll look into that. Might be just the thing to get me started and eventually figure it out on my own. When you say “quick to make”, do you mean just the amount of time you spend dealing with the cooking? We use our crockpot, and it’s definitely less than an hour of prep for me, but then it cooks for 6-8 hours while we’re out. I usually add mushrooms or carrots to every dish because they soak up the other flavors without adding too much outside the spice combo I’m using, so that helps us get in our vegetable servings. Also, cooking in bulk has really helped us eat at home more often. It takes longer to trim and brown ~2.5-3 lbs. of chicken, but it means that now I’ve got chicken for the whole week, and we just have to heat it up to eat it. We also frequently end up with a bucket of ground beef in the fridge as our “quick dinner” option. One of us will brown ~2 lbs. of ground beef with some onion, garlic salt, and black pepper, and then we can reheat it with a few other spices for quick spaghetti sauce, burritos, or quesadillas. Invest in some good spices. It’s pretty quick to put chicken in a glass dish, toss some spices on it, and bake for 30-45 minutes while you chop and saute the vegetables for sides. We like Stubb’s chicken rub, montreal steak seasoning, and Lawry’s seasoning salt. Some good pasta substitutes are quinoa and couscous. They cook in less time than pasta, and they’ve got more protein than simple carbs. You might also look at noodles substitutes with a cheap spiralizer. We use ours to make zucchini noodles, which we love. Spaghetti squash is also a good pasta sub that goes well with traditional spaghetti sauce and cheese sauces. By “quick to make” I mean that when we get home from work that it takes very little prep time (so that I can work while it is cooking if necessary) and we are eating within about an hour. The best use I’ve found so far that haven’t been mentioned is chicken stock! I throw a whole chicken/thighs/breasts/whatever in there with some carrots, onion, celery, and various seasonings (e.g. bay leaf, peppercorns, etc.). Fill to the max with water. Set for 45 min and let ‘er stew. Then I drain the liquid through a strainer and store in mason jars in the freezer. The meat I pick off the bones and freeze for various meals. A time saver, and soooooo cheap. Otherwise, I do lentils, beans, and rice mostly. Has anyone tried the Fagor LUX All-In-One Mult​i-Coo​ker? I use it to prep meal components in advance most often, including a batch of hard boiled eggs (magically easy to peel, go on salad nicoise the next day), beets, or yams. It’s also great for wild rice and other long-cooking grains. The delay function is great, and so I do polenta using the slow cooker function, ready and waiting when we get home. Hip Pressure cooking has a fantastic chicken and rice recipe that’s biryani-like and had the entire family fighting for the last bits, but it’s a little involved for our (very!) streamlined weeknight lineup. I haven’t used it as a rice cooker yet because rice is so fast on the stovetop, but maybe I’m missing out?